It works to enhance and integrate the long-term care sector. Singapore’s ageing population is rapidly increasing. By the year 2030, the proportion of elderly will be 14.64 % of the Singapore population. At the same time, the old-age support ratio will be declining to 2:1 in 2030, from 5:1 in 2014. The public sector continues to enable ageing-in-place through the introduction of new programmes, groups, and more recently, technology solutions. For example, we caught up with Dr. Tan Hwee Pink of SMU, to discuss the Shine Seniors program which places sensors in the home to enable the ageing in place. To this point, the launch of a new mobile app called AICare Link was announced this past weekend. This app aims to help senior caregivers check to see the eligibility for a range of government subsidies. It was developed by the Agency for Integrated Care, which works to enhance and integrate the long-term care sector. AICare Link can advise caregivers and the loved ones of seniors about getting the right care at the right place, enabling the ageing-in-place. To operate the app, the user must answer six questions to initiate the app assessment. The user will then be able to find out which financial aid schemes or grants the senior in question qualifies for. 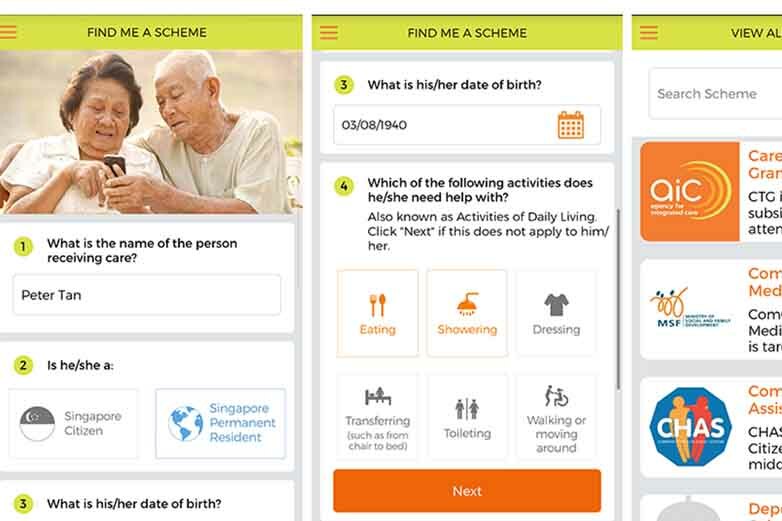 The app lists over 15 government subsidies, including: Caregivers Training Grant, Community Health Assist Scheme, Seniors’ Mobility and Enabling Fund, and the Foreign Domestic Worker Grant. The launch of this app was announced at the fifth anniversary celebration for the Teck Ghee Wellness programme. Prime Minister Lee Hsien Loong was present for the event, which was also attended by 1,200 seniors. It is emphasised that by doing so, seniors will be able to stay active and socialise with this community. They may also receive exclusive rates for karaoke and Zumba workout programmes. These programs and applications add benefits to the growing community of seniors here in Singapore. With these tools, seniors are becoming more connecting and more independent. By supporting the ageing-in-place, the country works to further mitigate risk and improve the quality of life for the elderly.